Hawkeye at the start. Photo by antor digital. Leaving the third and final checkpoint of the UP200 at Wetmore, the trail winds through pine plantations. small thin trees with an open sky. It always feels a little bit boreal, a high elevation illusion because we really aren’t at high elevation. The sky is a light lifted morning sky, the air alive. The trail ahead is long, but mostly downhill. It's a cruise into the finish. This year, more than the previous two years, I was so grateful to be on that trail home. This was a hard UP200, as the dog team lived with a stomach bug the entire race. Some of them, like Zippo and Hilde, powered through it. Some of them, like Fanzine and Bolt and Inferno, barely showed any signs of being affected. Some of them, like Hawkeye and Foreman, got a little bit grumpy but stayed committed to finishing. And some of them, like Nibbler and Wembley and Oriana, were taken out by it completely. While we have our ways of managing bugs, with metronidazole and psyllium, it really comes down to the dogs themselves with how it manifests. Just as with humans and the common cold or a stomach bug that spreads through an office or a household--some are down and out hard, and some barely sniffle. With that sickness as part of the team, that was the challenge we worked through in this race. It slowed the team down and diminished their positive attitudes, tails were slower to wag and faces were slower to go into food bowls, things I am not used to seeing on a race. I wrestled with that internally, but knew that we had, also, a baseline of conditioning and a commitment as a team that would get us to the finish line. Helping us through this race was the professional handler Al Borak, who has seen pretty much everything that can happen to a dog team over his decades of working with sled dog teams. He is a natural animal person, and gained the trust of some of the shyest dogs like Hilde. I know without his experience and knowledge of how to manage a dog team under stress, we wouldn’t have made it through the race. I am so grateful to him, being a handler for a sick dog team is a dirty job. Having seen a frigid cold and snow UP200 two years ago, and a warm and soft and sunny UP200 last year, this year was probably somewhere inbetween. There was a warm spring-like feel to the air, but not warm enough that things were melting or dog snacks weren’t going to stay cold. It, also, wasn’t so cold that vet checks, and the tasks of setting up the sled and gear before the start line, weren’t hard to do. The trails weren’t that pillowy soft UP trail from new snow, or a mushy punchy trail, but were hard and fast with a really good base. Every race is different, and this was definitely going to be a difrerent race. The start line of the race was well managed, caution tape set up to keep spectators from interfering with the dog teams as they did last year. As Bib 15, we were parked at the back, and after setting up the sled and lines, I walked forward to say hi to my fellow mushers. 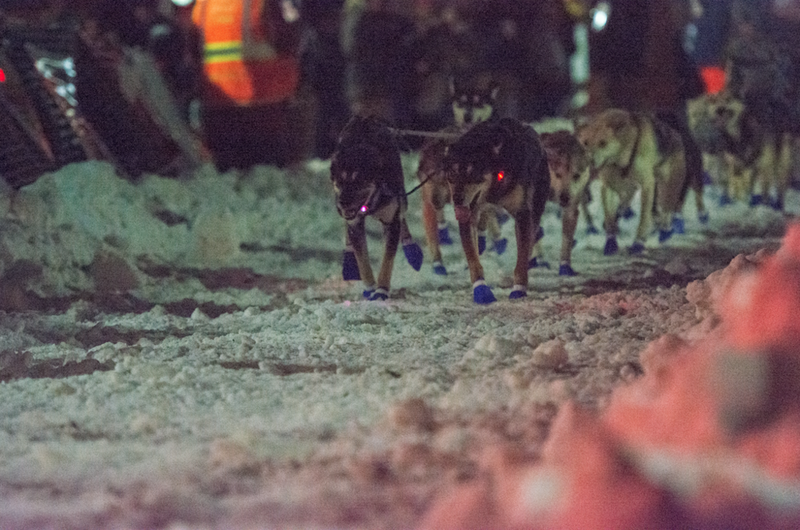 This race had 18 entries, representing the full spread of experience (from multiple champions of the race to rookies) and dog teams themselves (Pointy-eared Alaskans, fluffy Siberians, and houndier Alaskan teams). Many mushers I had shared the trail with before, in the UP or Can Am, and some I had met for the first time. This was going to be a good weekend. I wanted to do everything too early at the start line. I wanted to bootie them too early, I wanted to hook them up too early, I wanted to get them in harnesses too early. I was so accustomed to doing it all myself, and things taking twice as long. With Al, that was not the case. So, thus, the dogs were harnessed and bootied way too early, with them left harnessed and bootied on the truck, and I stood waiting until Al allowed us to hook them in. Hyside and Wembley would be leading us out of the start line. Hyside loves the UP200, the rolling gentle grades designed perfectly for his juggernaut momentum. Wembley, on the other hand, has always been less-than-thrilled by the UP200, but the lack of challenge and the lack of decisions. I also wasn’t sure how she’d do in the first 15 miles, where crowds line the railroad bed and ring bells and wave hands and kids run up to high-five the mushers. As I stood by the truck, the dogs harnessed bootied and ready to be hooked in, Wembley was standing quietly, and I wondered if she was into it enough to lead the race. This year was a year of not-quite-enough leaders, and I was asking Wembley to lead a race she does not like to lead. Then, she started tapping her toes. Her tail wagged. She rocked forward. She held out to the end of her drop chain on the truck. She gave a little howl. I leaned down to her with tears in my eyes. She was ready. Hooking the dogs in, the deer-in-headlights feeling started sinking in. I kept looking at the gangline and worrying that it was the wrong size. I forgot where dogs were supposed to run. There were dogteams hooking in and barking everywhere. Blake Freking, who had showed up to help (as he always does, helping the dog teams behind him), said to me ‘you’ve got time.’ Perhaps this drive to rush came from my start line at Eagle Lake this year, where I was booting dogs on the line and harnessing them as I brought them to be hooked in. As Bib 15, there were three mushers behind us, one of whom I knew would pass us early, and the other two I expected to leap frog with for awhile in the first leg. The railroad grade leaving town was a skim of granular snow over glare ice, and I rode my brake to keep them slow and under control. Keith Aili, who would go on to win the race, passed us on the railroad grade in the first few miles, his team running down in the ditch off the icy trail, beautifully moving. Both Kevin Mathis and Brian Kandler passed us on the railroad grade, but I caught both of them in the woods and stayed ahead of them the rest of the race. That first leg was flawless. Their speed stayed steady, I let them gain a little bit of speed towards the middle of the leg, but I was riding the drag mat uphill most of the time. Once we put some distance between us and Brian and Kevin, I knew we would be alone for the rest of the run. Hyside and Wembley drove the team, and the excitement was so palpable. We were having a good run. Everyone was eating, tails were wagging, and the energy was high and positive. We arrived to the checkpoint, and de bootied and bedded the dogs down. Everyone lay down almost immediately, Nibbler refusing her food. Nibbler sometimes doesn’t eat right away, so I didn’t think much of it at first, until I saw the diarrhea that was sign that she was the next one to show signs of the bug. Ariel got a full body massage from Al, and was wrapped in warming vests to hopefully keep her in the race. Coming into the checkpoint, I had a few dogs to move around but no one had any movement that was alarming. I decided to take a little over five hours at the checkpoint, and we left with 10 dogs and Wembley and Hyside in lead. The trail out of Wetmore downbound to the halfway point of Grand Marais is steady, a plateau. It takes straight turns through a symmetrical pine plantation, the sun rising ahead. In past years, we’ve driven directly into a burning red sunrise, or driving into the remainder of the snowstorm, daylight bringing clarity to the newfallen snow. This year, it was just a brightening sky amidst the pines. Hyside was slow leaving the checkpoint, which was fine as I kept them all slow to warm into the run. He was running a little oddly, and seemed to be struggling a bit at times. After a few miles, he seemed to be running smoothly and I didn’t let it bother me. I would take him out of lead at the first snack break, thinking maybe he just needed a break from being in front. So I swapped him out for Ariel, and put him in point with Fanzine. The sun rose and the day grew bright, and I realized that Hyside really did have a problem, which was a sore wrist. I sighed, because I knew I’d have to bag him, and as the biggest heaviest dog, I wasn’t particularly thrilled at the prospect. We were about halfway through the 55 mile run, and we were down to 9 dogs. I’ve heard other mushers tell stories of coming into Grand Marais, convinced their race was over. Ryan Anderson explained it to me as a product of the time of day, the length of the run, but with a good long rest at Grand Marais things can hit a restart button. This was my third time in the race, and I had not had the scratch-fever before, but I have had some goofy runs to Grand Marais. Once we left the fields, Wembley picked up the speed as I expected she would, as she knew we were coming into Grand Marais. The trail winds through people’s backyards and down driveways, and the entire team picked up speed as we chased a herd of white-tailed deer just before coming into the checkpoint. Coming into grand marais, ariel and Wembley in lead. Hyside in the bag. Coming in this year, I was convinced my race was over. I had my best UP200 leader in the bag, and I was pretty sure he’d be dropped. The teams' speed and drive was falling in a way I wasn't expecting. While Ariel had been strong in training, I wasn’t sure how she’d be racing as she didn’t like to lead races last year. And there was Wembley, who had led half the race already, and who I knew could lead the rest but not without a lot of work from me. And, there was the rest of the team, who were slowly getting sick. Debooting dogs, Zippo screamed as his wrist was sore. But, everyone ate and drank. They all lay down. Zippo and Hyside got wrist wraps, and Wembley got a shoulder vest and wrist wraps. Everyone was checked over thoroughly. I just didn’t have a good feeling. I had promised Al that I don’t get cranky during races, which is generally true, but I was starting to border on cranky. The race was not going well, and not only not going well, but I was starting to wonder if we’d be deemed non competitive and forced to scratch. I had all of this swirling in my head, during those 6 plus hours in Grand Marais. I felt powerless. I didn’t feel right. Al picked up on this, when I didn’t feel up to getting the team going again, and he called Christine. ‘I am so proud of you,’ she said. ‘Wembley loves you, she can do this.’ I cried. And then we got the dogs up to go again. We left with 9 dogs, and Wembley and Ariel in lead. We left Hyside behind. Aside from Wembley and Ariel, the only other leader was Fanzine as a backup. Not long after leaving Grand Marais, Wembley declared herself officially done and gave in to the bug. She kept stopping the team. I put her in the bag, put Fanzine in front with Ariel, and we motored forward slowly as 8 dogs just starting a 57 mile leg in the dead of night with a 55 pound dog in the bag. Blurry nighttime plowed road shot, on the leg to wetmore. ariel in single lead. As I watched Fanzine and Ariel, I started to get the sense that Ariel didn't need Fanzine up there. Ariel's tug was so tight, and her head was so forward. Fanzine had started backing off and wasn't driving as hard. With Foreman and Hawkeye each running solo, as we were running 8 dogs on a 10 dog line, I felt Fanzine could do more for them than for Ariel. Al had mentioned something about single leaders, and I had watched Justin Stielstra leave with a single leader. It was time to try it. Ariel first started leading short runs two years ago, and did so with insecurity. She never quit, but I got the sense that she wasn't quite sure she was meant to be up there. She looked back a lot, and preferred to chase a team ahead of us. I took it slowly with her, putting her in front on more and longer runs, giving her the chance to lead off-trail with Wembley on spring fun runs, and over two years she moved into leading almost half of our fall training runs this year. And yet, she hadn't led any real race miles. When I put Ariel in lead solo, in the dead of that night with a heavy sled and still 40 miles to go, I didn't know what to expect. I just hoped it would work. Ariel zipped forward and led the team, solo, for the rest of that run, and all the way to the finish. For 100 miles at the end of a long hard 240 mile race. She never looked back. Her tug never slacked. She stood straight out when we stopped, and took turns with confidence. I could just barely see her face at times, and I could see her smile. She was plugging along up there, and was truly happy. That little tater tot of a girl had become a true leader. The rest of that run to Wetmore upbound was slow but steady. I never doubted their ability to get there, but I knew it was slow. This was Can Am slow, taking 7 hours to run 55 miles. I knew that we would not be picking up much speed from this point forward. I knew that our last leg, those 68 miles to the finish, would be 9 hours of running if not more. I had some decisions to make in that checkpoint, and I also needed to know if we would be allowed to finish. When I woke up, I knew we would keep going. We’ve had long slow sunny runs before, and I knew the team had it in them to finish. We emptied every bit of unnecessary gear out of the sled, stripping it down as lightly as possible, and Al changed the plastic and waxed the runners. We walked every dog, and Bolt showed a shoulder soreness and would be left behind. Hawkeye was bouncing off his rear foot, a sore toe that he had been carrying with him for awhile. He had warmed into it in the last leg, and I hoped the same would be true again. I didn’t want to have to bag the biggest dog in the team. We left with seven dogs, with Ariel still in single lead. At the moment we were ready to get going, Lynne Witte showed up. Lynne is a friend who had trained and raced Ariel as a yearling, and who still has Ariel’s sister Snow White as her main leader. I told Lynne what Ariel had done, and Ariel was so pleased to tell Lynne herself. Just as with the start line, I insisted on getting ready too early, and we had a long time waiting at the gate leaving the checkpoint. But still, the dogs were happy, Inferno lunging forward and Fanzine talking the entire time. Ariel stood, stock still, but she is always serious and focused and shows no sign of excitement. Leaving the last checkpoint, Ariel still in single lead. Photo by Lynne witte, who had trained ariel as a yearling. This last run was a slow run. I expected it would be, the dogs and myself both tired after two long runs with a heavy sled. The descent to Marquette can be slow, long straight roads without end. I set up my iPod with a series of comedy podcasts to keep myself giggling, and thought carefully about how to manage the team to keep them motoring forward. At every break and snack, Ariel would lunge forward again. Fanzine would turn back and howl, and Inferno would leap into his harness. The last 10 miles to the railroad grade seemed impossibly long, as we passed through the birches and beeches and the swamp of The Nature Conservancy property. My mind played games with where I thought I was, as I resisted pulling out my GPS for fear of being disappointed at how slow we were going. And, as always, the railroad grade showed up quickly and unexpectedly. Yet, we had a slightly awkward end to our race, with the finish line moved last minute and without great communication between the race, handlers, and volunteers. The ending point was moved, but there was no actual finish line. Due to confusing communication, I was flagged down by a spectator who told me to stop. She had just gotten the word from Julie, the handler and wife for the musher Mary who was right behind me, that the finish line was moved to Lakenenland, the finish line of last year, because of the growing dark and the fear of safety of teams heading through downtown Marquette. At the moment, all I could feel was crushing disappointment. There was no banner, bonfire, race judge, race timer, nor Ross the finish line coordinator. Al, our handler, was not there. The vets weren't there. There was no banner marking the completion of the race we had worked so hard to finish, there was no familiar face. There was no line on the snow marking where I was to stop. There was just the dogs, and me de-booting them at the side of the trail a tears of the wrong kind came down my face. It felt like a scratch. It was a heartbreaking and confusing end to a long hard race. As I stood there and waited, eventually a few volunteers showed up, then the Frekings (Jen Freking joking ‘do you need anything from your vet team?’), and then Al to lead us to the truck. I’m not sure how they figured out the timing for our race, but I’ll accept the guess they made. Winding through the pine plantations. ariel in single lead, with fanzine, Foreman, zippo, hilde, inferno and hawkeye backing her up. As the days and weeks passed, I still feel that crushing disappointment. I do recognize why the finish line was moved, and that volunteers work hard, but the execution was not done well and was inconsistent with what I have come to experience from the UP200. It was easy to predict that there would be mushers finishing in the evening on Sunday, based on the times posted by Saturday afternoon and early Sunday morning. (My sister, Rachel, for example, while not a musher or a race organizer has seen me race in enough races that she did the math and anticipated an 8 p.m. finish). Every musher and team deserves a true finish line, especially so those at the back. The three mushers behind me were all in their first UP200. The sleepless handlers had routines and dropped dogs to take care of. The dogs themselves need that finish line as well. It is a weird feeling, it is a feeling that the back of the pack doesn’t matter as much, and a feeling that maybe you aren’t as welcomed in a race if you aren’t at the front. Having crossed finish lines at the front of the pack, the middle of the back, and the back of the pack, the times I’ve appreciated a finish line the most are when I was at the back of the pack. (editors note: the good news is that two weeks later, Ariel got her finish line accolades when she single-led the second leg of the Can Am 100. I made sure that she got the finish line she deserved in that race). This race is populated with so many kind and generous souls. My newfound home with the sisters Shan and Jill, who hosted us during the race and kept me well fed and warm and smiling. The sisters are my new family in Marquette!! The kind presence of Lloyd Gilbertson, who also hosted us for a night, and the spunky pistol Lynne Witte who showed up at the right place at the right time in the third and final checkpoint. The Stielstras who have always been a generous and helping host before, during, and after this race. Jen Freking who worked on Hyside's wrist, even when she had her own team to care for. Erin Altemus who showed up and ran her first race since 2016, and we usually managed to share a moment when she was on her way out and I was on my way in. The hardworking volunteers who make this race happen, who design and groom the magic carpet ride of a trail, the thoughtful checkpoint coordinators, the communication team, and so many more. And, more than anyone else, the professional handler Al Borak who came out of (semi?) retirement to handle and get us through this race. This is a race that is very hard on its handlers. I know we could not have finished without Al's skills, without his knowledge of dog teams under stress and connecting with and building trust with dogs who don't know him, and I learned a lot from him. A lot. Thank you, Al. As with all hard races, I am so so so proud of these dogs. I learn more about and from them in races like this. I learn where their stress points are, and what they need to stay on the track that they really do want to stay on, which is the track that leads to the finish. 13th place. Third UP200. Sixth 250ish mile race in the past four years. Unbelievable lessons learned.